If, as Walter Benjamin claimed, “it is the function of artistic form … to make historical content into a philosophical truth” then it is the function of criticism to recover and to complete that truth. Contemporary art makes this work more difficult than ever. Today’s art is a point of condensation for a vast array of social and historical forces, economic and political forms, and technologies of image production. Contemporary art, Osborne maintains, expresses this condition through its distinctively post-conceptual form. These essays moves from a philosophical consideration of the changing temporal conditions of capitalist modernity, via problems of formalism, the politics of art and the changing shape of art institutions, to interpretation and analysis of particular works by Akram Zaatari, Xavier Le Roy and Ilya Kabakov, and the post-conceptual situation of a crisis-ridden New Music. 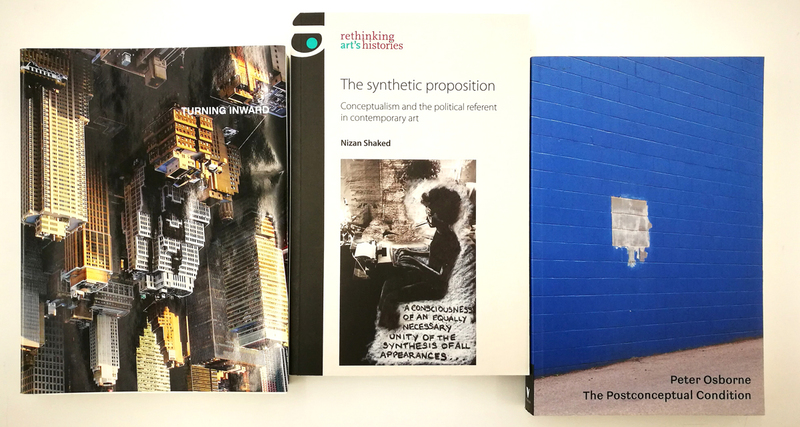 The synthetic proposition examines the impact of Civil Rights, Black Power, the student, feminist and sexual-liberty movements on conceptualism and its legacies in the United States between the late 1960s and the 1990s. It focuses on the turn to political reference in practices originally concerned with abstract ideas, as articulated by Joseph Kosuth, and traces key strategies in contemporary art to the reciprocal influences of conceptualism and identity politics, movements that have so far been historicised as mutually exclusive. The book demonstrates that while identity-based strategies were particular, their impact spread far beyond the individuals or communities that originated them. It offers a study of Adrian Piper, David Hammons, Renée Green, Mary Kelly, Martha Rosler, Silvia Kolbowski, Daniel Joseph Martinez, Lorna Simpson, Hans Haacke, Andrea Fraser and Charles Gaines. By turning to social issues, these artists analysed the conventions of language, photography, moving image, installation and display. Turning Inward comprises a selection of texts by international artists, critics, and curators, which aims to renegotiate the relationship between centers and peripheries in contemporary art worlds. In the context of advanced globalization, the distributed agency of networked power structures can hardly be localized any longer in geographical terms. Yet, if we are to turn our attention away from geographical—that is, horizontal—relations, we can conceive of the central and peripheral as vertical phenomena that can coexist spatially in the shapes of social constructions, genealogies, or epistemic formations. Against this backdrop Turning Inward provides a heterogeneous range of critical reflections upon contemporary art and its modes of production, distribution, and consumption. Reaching far beyond the spatial metaphor, the positions assembled in this volume touch on fields such as art history, philosophy, economics, gender studies, urbanism, language, and education.